Puffin, Zebra, Toucan, Pelican and Pegasus are all different types of pedestrian crossings. Pedestrian crossings are safer places for pedestrians to cross the road and where they are given priority. 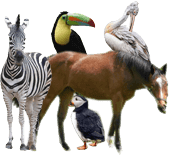 There are various different types of pedestrian crossings, these are: Zebra, Pelican, Puffin, Toucan, Pegasus (also known as Equestrian crossings). A school crossing patrol officer might also want you to stop near schools. Make sure that you never park or overtake on the zig-zag lines near pedestrian crossings. Stopping on pedestrian crossings should always be avoided. You should never wave at pedestrians to cross as other drivers might not stop for them and you could put the pedestrians in danger. Be careful of pedestrians that could run across the road from an angle and not start at the crossing. Learn all about the different pedestrian crossings and then test your knowledge with our pedestrian crossings quiz. 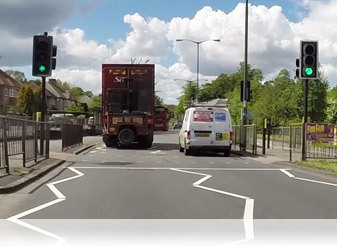 You will notice zig-zag lines and traffic lights on approach to a Pelican crossing. This crossing is activated when a pedestrian presses a button. The traffic lights will then change from green to amber and then to red. After a period of time, the traffic lights will then change to a flashing amber light (meaning that you can drive on as long as the pedestrians are no longer on the crossing) and then green. Give way to any pedestrians that are still on the crossing even if you have a green light. This applies to all pedestrian crossings. A Pelican crossing is the only crossing which has a flashing amber light as part of its sequence. If a pedestrian is waiting at the crossing and it looks as though they've pressed the button then you can anticipate that the traffic lights may change soon. Pelican crossings may be in a straight line or staggered. If the pelican crossing goes straight across the road then you would treat it as one crossing even if it has a central refuge. If the crossing is staggered and not in line then the crossings are treated as separate. Pedestrian User-Friendly Intelligent crossing (bit of a mouthful) or Puffin crossing for short. These pedestrian crossings look very similar to Pelican crossings, but have sensors on top of the traffic lights. These sensors detect if pedestrians are crossing slowly and can hold the red traffic light longer if needed. These do not have a flashing amber light as part of its sequence and phase like normal traffic lights. Zebra crossings are easily recognisable because of the black and white lines that go across the width of the road. On approach to a zebra crossing you will notice flashing amber beacons and zig-zag lines on the road. Because there aren't any traffic lights, it will be up to you to ensure there aren't any pedestrians wanting to cross. Make sure that you check both sides of the crossing properly before proceeding in case of an approaching pedestrian. Be careful of any pedestrians that might run onto the crossing from an angle. Don't try to hurry any pedestrians on the crossing, give them time to finish crossing the road and don't wave them to cross or use the horn. Split zebra crossings (see picture) should be treated as two separate crossings. Toucan (Two can cross) crossings are similar to Pelican crossings, but they allow cyclists and pedestrians to cross (best way to remember the name is 'two can' cross). These are normally found near parks or cycle lanes. Toucan crossings do not have a flashing amber light as part of its sequence and phase like normal traffic lights. These are the least common type of pedestrian crossing. Similar to Toucan crossings, but these allow horse riders to cross too. These crossings have two sets of buttons at different heights. One is at a normal height for pedestrians and cyclists and another which is positioned two metres above the ground for horse riders. This helps the horse riders as they don't have to dismount in order to operate the crossing. Sensors detect movement on the crossing and can hold the red light longer. Pegasus crossings do not have a flashing amber light as part of its sequence and phase like normal traffic lights.